Sunday February 10th 1878. It has almost stopped snowing this morning. George and I went to church in the sleigh. I went home with Mrs. Beecher to dinner. We had a good visit till about four oclock when I went over to Works and stayed till church time. We went to church and Will Work took me out home. I wrote home and to Charlie after I got home and visited with Tom. 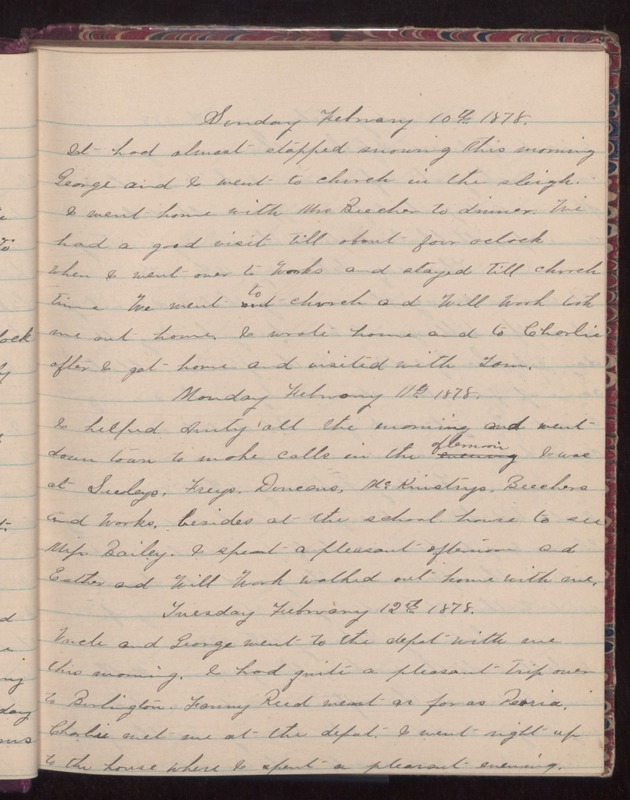 Monday February 11th, 1878. I helped Aunty all the morning and went down town to make calls in the afternoon. I was at Seeleys, Freys, Duncans, McKinstry's, Beechers and Works, besides at the school house to see Mrs. Bailey. I spent a pleasant afternoon and Esther and Will Work walked out home with me. Tuesday February 12 1878. Uncle and George went to the depot with me this morning. I had quite a pleasant trip over to Burlington. Fanny Reed went as far as Peoria. Charlie met me at the depot. I went right up to the house where I spent a pleasant evening.